SIZE : 255 40 19 96V. MAKE : DUNLOP. MODEL : SP SPORT MAXX GT. APPROXIMATE TREAD DEPTH : 5mm. ONE PUNCTURE REPAIR. JANUARY CLEARANCE SALE. 2 X 255 40 19 96V DUNLOP SP SPORT MAXX GT. (PRESSURE TESTED). All tyres are tested and made sure to be fit for purpose before dispatching. OUTSIDE: 6.5mm - MIDDLE: 6.5mm - INSIDE: 5mm. Single tyre in mint condition. Dunlop SP Sport 01. tread depth tyre1 6mm . load/speed index 100Y XL MFS. repairs no. tread depth tyre4 ==. tread depth tyre3 ==. 1x 255 40 19 100Y DUNLOP QUATTROMAXX TYRE EXTRA LOAD 5.5mmone professional puncture repair in centre of tread. Other sizes of Winter wheels and Tyres available to be listed shortly. Carried out at Stafford ST16. Make - DUNLOP SP SPORT MAXX GT. Size - 255 40 19. PA20 - 49, PA60 - 78, PH1, PH5 - 10, PH15 - 18, PH19 - 44, PH49-50, IV1 - 28, IV30 - 32, IV36, IV41 - 56, AB31 - 38, AB43 - 45, AB51 - 56, AB41, AB42, FK19 - 21, HS1 - 9, ZE1 - 3, KW1 - 17, KA27 - 28, TR21 - 25, BT1 - 94, IM1 - 99, GY1 - 9, JE1 - 4, ZE, TR21 - 25. 1 x 255 / 40 / 19 100Y DUNLOP SP SPORT MAXX GT PART WORN TYRE. Lowest Depth Across Tyre. Lowest Tread Depth. No Repairs - Slightly Stepped, Worn & Cut. 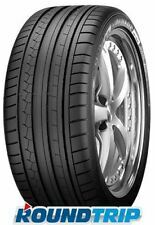 255 40 R 19 100Y Dunlop SP Sport 01 MO 6mm H36. TYRE WIDTH : 255. TYRE ASPECT RATIO : 40. NOTE: Due to the lighting and positioning of the pictures taken of this tyre, we understand it may be difficult to make out the tread depth of the tyres. 2 x 255 / 40 / 19 96V DUNLOP SP SPORT MAXX GT PART WORN TYRES. Lowest Tread Depth. Lowest Depth Across Tyre. No Repairs - Slightly Stepped, Cut, Cracked and Worn. BOTH TYRES HAVE 4MM TREAD DEPTH REMAINING. Cash - Collect in person from our - Depot, but be sure to call us before hand to arrange. Any Puncture Repair. Credit or Debit Card - Call us. 2 x 255/40 R19 / 96V. DUNLOP SP SPORT MAXX GT. PAIR OF USED TYRES. 14 WANDLE WAY MITCHAM. We have a large number of quality tyres. GREAT TYRES. Extra £24.99 to Republic of Ireland and Channel Islands. 255 40 R 19 96V MFS Dunlop SP Sport Maxx GT 4mm C528. NOTE: Due to the lighting and positioning of the pictures taken of this tyre, we understand it may be difficult to make out the tread depth of the tyres. Dunlop Tyre SP Sport Maxx GT. 1 professional puncture repair (pressure tested). Removed from my own BMW M5 (car drove perfectly ). Inner 4.28. 255 40 R 19 96V MFS Dunlop SP Sport Maxx GT 3.5-4mm C229. NOTE: Due to the lighting and positioning of the pictures taken of this tyre, we understand it may be difficult to make out the tread depth of the tyres. 1 x 255 / 40 / 19 96V DUNLOP SP SPORT MAXX GT PART WORN TYRE. Lowest Depth Across Tyre. Lowest Tread Depth. No Repairs - Slightly Stepped, Cut and Worn. 2 x 255 / 40 / 19 96V DUNLOP SP SPORT MAXX GT PART WORN TYRES. Lowest Tread Depth. Lowest Depth Across Tyre. No Repairs - Slightly Stepped, Cut and Worn. MODEL: SP SPORT MAXX RT (RIM PROTECTOR). TREAD REMAINING: 4.5MM. JUST BEFORE AUTOWELL MOTOR FACTORS. ANY PUNCTURE/REPAIR: NONE. FITTING APPLIES AGAINST £55.00 CASH ONLY OR COLLECTION. OPENING HOURS. ANY TYRES THAT HAVE BEEN REPAIRED ARE REPAIRED TO BSAU159 STANDARD. AB13, AB14, AB15, AB23, AB30, AB31, AB32, AB33, AB34, AB35, AB36, AB37, AB38, AB39, AB41, AB42, AB43, AB44, AB45, AB51, AB52, AB53, AB54, AB55, AB56 TR21, TR22, TR23, TR24, TR25, FK19, FK20, FK21, G63, G83, G84, HS1, HS2, HS3, HS4, HS5, HS6, HS7, HS8, HS9, IV1-28, IV30-32, IV36, IV40-49, IV51-56, IV63, KA27, KA28 KW1, KW2, KW3, KW5, KW6, KW7, KW8, KW9, KW10, KW11, KW12, KW13, KW14, KW15, KW16, KW17, PA20-38, PA41-49, PA60-78, PH3-11, PH15-26, PH30-44, PH49-50, ZE1, ZE2, ZE3. Dunlop SP Quattromaxx 255/40 R19 100Y XL, MFS, RO1. Maximum Flange Shield [MFS]. A rim flange protection system. MFS employs a profile of rubber that runs around the circumference of the tyre above the wheel flange. This creates a protective buffer zone. 2 x 255 / 40 / 19 100Y DUNLOP SP QUATTRO MAXX RO1 PART WORN TYRES. Lowest Tread Depth. Lowest Depth Across Tyre. 2 X British Standard Repairs - Slightly Stepped, Cut and Worn. Manufacturer Dunlop. UK TYRES 131 SCRUBS LANE (NORTH WEST LONDON). FREE FITTING. ALL TYRES WILL 100% PASS MOT NONE. Tread Depth. (2 PW 175 65 15(84T)BridgeStone Blizzak LM-30 M S Tread 6.5mm-7.5mm. 2)Wheel Balancing. 255 40 R 19 96V MFS Dunlop SP Sport Maxx GT 3.5-4mm C492. NOTE: Due to the lighting and positioning of the pictures taken of this tyre, we understand it may be difficult to make out the tread depth of the tyres. Any Puncture Repair. Tread depth - Middle. Tread depth - Outer edge. Tread depth - Inside edge. This tyre has a minimum of 4.0mm thread remaining, a new tyre has 8mm. Item must be unused, not fitted and in re-saleable condition. THESE TYRE'S HAVE 4.5MM Tread Depth REMAIN ING. TYRE MODEL: SP SPORT MAX GT. 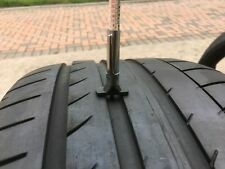 THESE TYRE,S HAVE BEEN PRESSURE TESTED. AGAINST £100.00 CASH ONLY. FREE FITTING APPLIES AGAINST £110.00 CASH ONLY OR COLLECTION. Dunlop Sport Maxx GT. 4/4.4mm Tread. Our tyres are not from recovered vehicles but from garages who replace them for their MOT’s! 2x 255/40/R19. Free fitting is available on all of our tyres. Cash - Collect in person from Alpha-Tyres. Dunlop SP Sport Maxx GT 255/40 R19 96V MFS. Each tyre has a minimum of 3.8mm of tread. There are no punctures or repairs. For sale are aPAIR of part worn Dunlop SP Sport Maxx GT 255/40/19. MODEL: SPORT MAXX RT 2 (SOUND SHIELD). TREAD REMAINING: 5MM (RIM PROTECTOR). JUST BEFORE AUTOWELL MOTOR FACTORS. ANY PUNCTURE/REPAIR: NONE. FITTING APPLIES AGAINST £80.00 CASH ONLY OR COLLECTION. OPENING HOURS. Dunlop SP SportMaxxGT (255/40/19) 96V (RO1) TYRES! Tyre 1 has a tread depth of 4.9mm-5mm-5.5mm (inner-central-outer).Tyre 1 has a puncture-repair. Tyre 2 has a tread depth of 5mm-3.8mm-5mm (inner-central-outer). Dunlop Sport Maxx RT 2 255/40 ZR19 100Y XL, MFS. The tyre is in good condition with approx 5.4mm of tread remaining. A fitting service is also available at our tyre warehouse in Timperley. Tyre 1 4.6mm 3.7mm 4.1mm. This tyre has a minimum of 3.7mm of thread remaining, a new tyre has 8mm. Cash - Collect in person from our Walsall Depot, but be sure to call us before hand to arrange. Any Puncture Repair. 255/40/19 '96V' XL DUNLOP SP SPORT MAXX GT. The Tyre Has No Puncture Repairs. Dunlop Sport Maxx RT 2 255/40 ZR19 100Y XL, MFS, NST.